Today was a snow day. We all stayed home and had a bonding experience. My friend Mindy’s husband took this video of the streets of New York “aka the city” today. His commentary is hilarious. I just had to share it! I have never tried to post a video before, so I hope it works! I am trying to think warm thoughts and visualize the positive. STELLA !!!!!!! March’s winter tantrum.. The bikes out were funny to see but sad too.. Someone went to a lot of work to put them out there.. 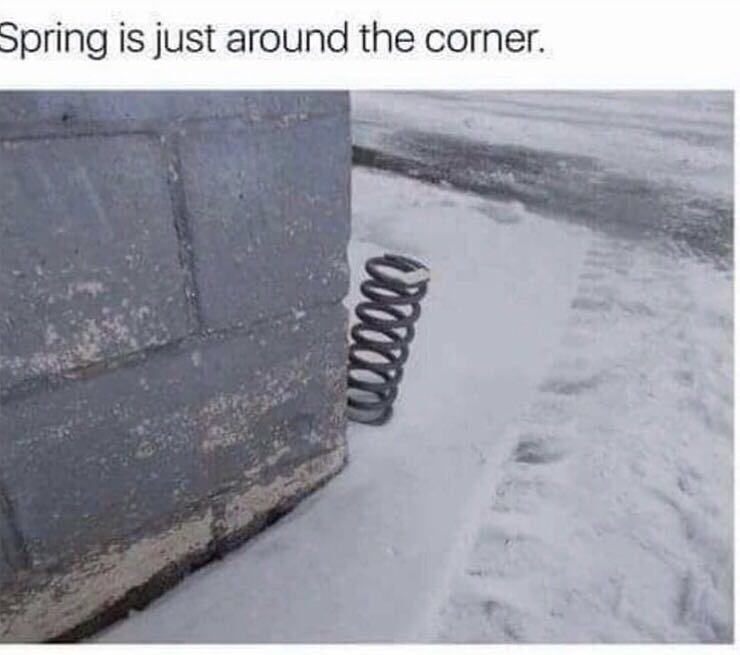 The picture of a BIG Spring just around the corner, please let that a wonderful pun come true !!!! Congrats on your first video post ! It was so funny. Hard to believe as the snow is already beginning to melt. I loved it too. When do you ever see something like that? A perfect opportunity for fun and down time. It was either that or whine and cry about being forced to shut down for 30 plus hours.. Where I was, the storm had moments of beauty when the winds weren’t rocking the truck..
That video is great Carol. Lots of us digging out from what was originally snow and ice but is now all ice. Usually if we have weather like this in March it warms up almost immediately afterwards. Not this time. Spring should still be around the corner…now where DID we put it?! I thought so too. I had to share it. Bonding experience while being snowed in – that’s precious! How is Raizel doing? Not so great.😕 Her rash has returned. I have never seen something like this. I am not sure if I was cut off or didn’t send anything at all. Anyway, when I moved to Florida, I had a severe allergic reaction to a Palmetto bug I had touched accidentally (you know, those huge the flying roaches), and a doctor in the ER suggested Desitin, the baby ointment. While you are looking for causes of the rush, perhaps you can alleviate her suffering by shmearing some Desitin on her. It wouldn’t hurt! Tried that too. To protect her privacy, I will try to be discrete. Let’s just say that my domestic and professional boundaries are overlapping. So, you can imagine I am sure what I am dealing with. I understand and I am so sorry! With H-shem’s help, they will figure out the allergen, and she will recover, but meanwhile the poor child is suffering! Refuah sheleima! She really is. Being itchy when you have sensory issues is not fun. She is a sensitive soul.